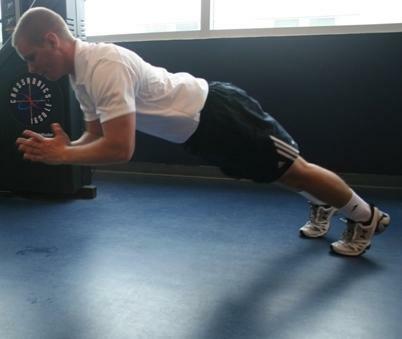 Standard push-up position with the arms on the floor slightly wider than shoulder width, and the body maintained in a straight line. Lower the chest to the floor and forcefully extend the arms to propel the upper body completely off of the floor. When loss of ground contact occurs, perform a clap before falling back into position with the chest lowered to the floor. As soon as the chest is lowered to the floor rapidly perform another repetition to minimize contact time with the floor. A progression would include getting the feet off the floor as well.